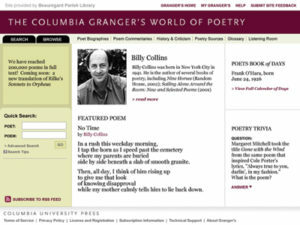 The Columbia Granger’s World of Poetry Online, updated weekly with new full-text poems, biographies, and commentaries, offers users access to 250,000 poems in full text with 450,000 poem citations. The database includes all poems indexed since the 8th print edition (1985). 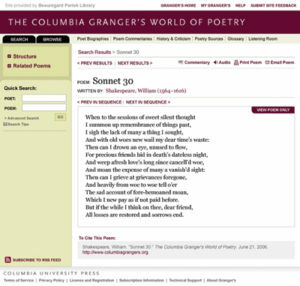 Granger’s also includes a wide range of critical and historical tools and features to enhance understanding and enjoyment of poetry. Follow Granger’s on Twitter and Facebook. Editor William Harmon and a board of consultants that consists of poets, scholars, and librarians ensure the highest standards of scholarship. Granger’s features a completely redesigned database with greatly enhanced functionality. Searching, both simple and advanced, is very user-friendly, with new searches available by era or school, nationality, language, cultural identity, gender, and form. For the first time, users can browse the many parts of the database—poems, poets, anthologies, biographies, commentaries, and subjects. The Browse Subject feature organizes Granger’s 6,000 subject headings in a hierarchical structure of related themes and subjects, affording users a unique opportunity to explore and discover poetry in a meaningful and visual manner. Please call (212) 459-0600, ext. 7112 to get full pricing full information.